The tiger's mouth can be perfected into a diamond. 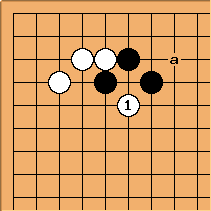 A black play at a, although slow, would therefore make nice shape but not as nice as if it were a ponnuki. is a very common peep, peeping at the tiger's mouth. It threatens to cut at b, while denying Black the rather nice shape of the diamond. This is no raw peep but a rather interesting peep. The only loss is the atari on either of the Black moves. 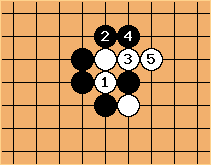 This kind of context is reasonable - a tenuki line after a pincer (marked black stone, might also be at a). If no black stone on the upper side, is weird direction. 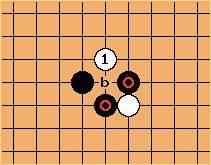 As this sort of quasi-peep it makes some sense in fighting; Black b or c are seen in pro games now. There are several local replies possible. Even a moron connects against a peep. This is therefore the most common (basic ?) answer. 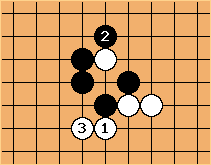 If White cuts immediately, these sacrifice tactics may be very useful for Black. 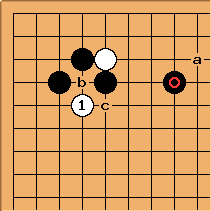 Adding another stone and allow the connection may be against the purpose of White's peeping stone. Black on his turn must be aware of this kind of sequence. Which is why you may see this sequence. Also, White may leave the cut as aji so that the peep may have fullfilled its purpose altogether. DaveSigaty: This page seems to be based on tacit agreement to imagine a situation different from the one shown in the diagrams. Almost all of the discussion seems to be based on this situation. Dieter: It was not consciously conceived with what follows in mind. It may have been my unconsciousness, but if so, I am still unconscious about it. Useful comments, Dave, as usual. The main opportunity forgone by playing at is the play at a. This is generally true if we slightly generalize the position as below. In this position, if White plays next, she peeps at more often than any other play. 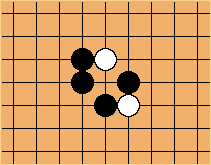 It is the only case where the peep is the most common line of play for White. In this position on the other hand, is an unusual play. 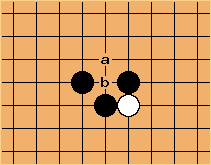 White is much more likely to continue with a or b given the opportunity. Here a is the main choice with b next. The peep is almost unheard of. Finally, in the position used for most of the analysis above, the peep at is the 10th ranked choice for White shown in GoGoD CD (11 cases out of 873 where White plays next). 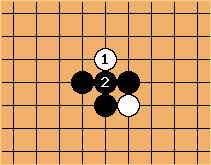 White mainly plays a or b (around 300 cases each). This page is about peeping at a Tiger's Mouth. 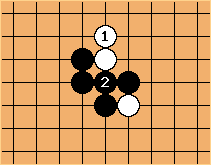 The idea seems to be to prevent Black from playing at in the last diagram. 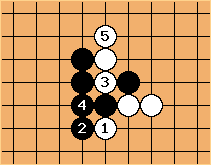 In practice Black doesn't (1 case out of 110 where Black plays next in the last diagram). In general practice the peep is not the first choice. It always strengthens Black and it is not connected to the other white stones creating the Tiger's Mouth. There must be some other factors (e.g. relations to other stones) contributing to the value of the peep for it to make sense. Charles Matthews Dave correctly points out the rarity of this peep as a mid-board pattern (the reason in fact I added the tenuki joseki example, to keep our feet on the ground). For myself I'm not sure what is and isn't a tiger. No matter - we can discuss patterns under any name.